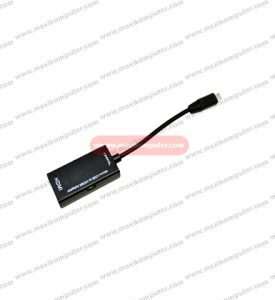 The MHL (Mobile High-Definition Link) Adapter is an accessory made with one purpose in mind to connect your MHL Host, like MHL Phone or Tablet, to your HDTV for viewing content on a larger screen. This state-of-the-art technology connects your MHL Host to your monitor or TV from the micro USB port to the HDMI port. Uses a single, thin adapter to connect the mobile device to the HDTV. Connects Micro USB Female port to Computer or Power Adapter for charging and getting power using a Micro USB to USB M/M cable. Supports Max resolution to 1280x720p and all bandwidth between 25-75MHz. Compatible with Samsung Galaxy S II i9100, Galaxy i997,Samsung I997 Infuse 4G, HTC G14 Sensation, HTC Flyer,HTC EVO 3D.